Noon offers a good looking smart lighting system you can control three ways but it comes at a cost. Noon is a smart lighting system that does a bit more than brighten up your home. Enhancing your lights is just one of the many things Noon can provide — but there are some challenges to installing this system, depending on the electrical in your space and the devices you want to make smart. Noon was kind enough to send to us their Starter Kit to test, and here's what we found after installing the Noon Smart Lighting system in a real home. What is Noon Smart Lighting System? Noon is a smart lighting system that works with smart switches to operate lights with just one touch. Everything runs through a primary controller called the Director, a black switch with a high-resolution OLED display, that reacts to a touch or a swipe. You can turn the lights on and off, or run programmed scenes you set up through the Noon app. Noon also comes with a white Extension switch, used when you have additional light switches in a room or on the current lighting system, that pairs with the Director switch. All the switches in the Noon system can act as dimmers if you have lights that can be dimmed. You can operate Noon three ways: via the switch, the Noon app or with your voice through both Google Assistant and Amazon Alexa as long as you connect the system to one of these devices. How Noon Products work together? Also check if the smart switches you want to install requires a hub to work with other connected devices — or can work on their own. Noon switches don't need a hub, and instead communicate from the Director switch to the Extension switches through Bluetooth. Noon switches also work through your home's Wi-Fi network which lets you operate them through the smartphone app as well. Third party light switches and wall plates will work with Noon. We had no trouble using a rocker style switch — but note that a third party a toggle switch won't work. Noon is also compatible with multi-way light switches with circuits that have up to four switches. Where to place the Noon Switches in a room? We think the best place to install Noon is a room near the entryway. Reason is the switches can act as either smart switches or dumb ones, depending on the user. We know many consumers are still programmed to turn the lights out when leaving the room — but Noon has act as a smart switch, meaning you can turn the lights on and off via an app, and also as a standard switch letting you run your lights by touching the actual device. Noon's Director switch also functions as a night light: Walking up to the Director switch turned its LED light on so you can see it. That's a nice feature to let you activate scenes without turning on all the lights around you. As we mentioned, smart switches need to have the right wiring to work. Noon needs four different switches to work, each with a wire connector. If you're installing one or more Noon switches, your junction box needs to be deep enough to house all these wires and connectors. Noon switches also tend to be a little fatter than a traditional rocker or toggle switch — and we ran into an issue, where we blew the Extension switch after the ground wire came loose. GearBrain found pairing the switches to be very easy, but installation was not. If you're not comfortable working with electrical system, we recommend hiring an electrician. However, Noon does provide installation instructions in the box, and there are also videos to walk you through installing its smart switches. You can find the same In the Noon app by selecting "Noon Home Support." After installing the switches, we followed the pairing instructions in the Noon app to connect the switches to our home Wi-Fi. After they're connected to Wi-Fi you can set-up each switch. Start with the Director switch and and then each Extension switch. You can connect with up to 10 Extension switches with one Director switch, which is great if you have a large room. Contact Noon's customer service with any issues —their contact information is in the app. After blowing the first Extension switch, and running into difficulties connecting to the internet, customer service helped us get online. You can also try resetting all the switches and starting over, which may fix some issues. Noon switches also work with LIFX and Philips Hue smart bulbs if you use them in lamps in your home — they worked in our space. We suggest you follow the instructions in the Noon app to setup either of these integrations. Noon switches are rather expensive. Normally a smart wall switch is priced between $20 to $100. For instance, each Philips Hue smart switch costs $20, while Leviton Decora and TP-Link Kasa smart wall switches run less than $50 on average, nor do they require a hub. A single Noon Director switch retails for $249.99 and each extension switch costs $129.99. Noon does offers a Room Bundle (one Director and two Extension switches) for $529.99 on their website. You can also get wall plates that start at $9.99 for one switch and go up to $19.99 for four switches. You can buy Noon smart lighting system on the Noon Home site. Professional installers also offer them, if you don't want to install them yourself. Amazon also offers Noon products through resellers, and you can buy them on Home Depot and eBay. 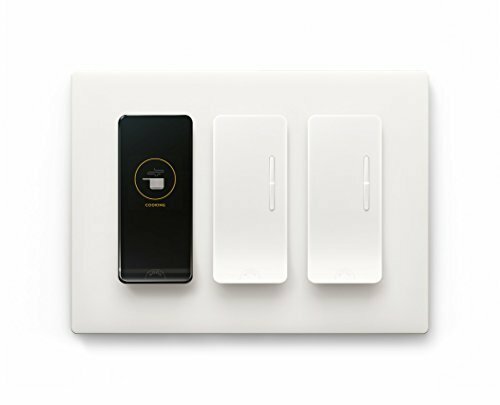 Noon Smart Lighting System comes with sleek-looking wall switches that provide easy control of your lights in your home without the need of a hub. Noon has done a nice job of building smart home integrations with LIFX, Control4 and the leading smart speakers, Google Assistant and Amazon Alexa. We like how Noon switches also works with If This Than That or IFTTT to automate recessed ceiling lights or LIFX smart bulbs. We also think it's a nice touch how Noon helps you figure out the type of bulbs you have in each room. Just remember that before buying Noon — or any smart wall switch — check the wiring in your walls, and if your junction boxes are deep enough to house all the wires and connectors. This is particularly important if you live in an older home, built prior to 1980 — you don't want to get home and find you can't install the system. If your home has the right wiring with neutral and ground wires, and there is room in your junction boxes, then Noon is an option worth considering. Again, keep in mind Noon is a premium product — and only you can determine if its price is worth its functionality. Other brands offer similar home integrations without a hub as well. Leviton Decora smart wall switches, for example, work with Nest, August Home, Amazon Alexa and Google Assistant devices, as well as IFTTT, and costs less than $60 per switch. However, Leviton and other smart wall switches don't let you control all the lights in one room from a single switch like Noon, nor function like a night light. We like the look and functionality of Noon switches — and like that they're compatible with many leading smart home devices and systems. If you want smart switches that can be controlled with your voice, through an app and with the simple swiping of a finger, then we think it's worth taking a look at Noon, as long as you keep its price in mind.